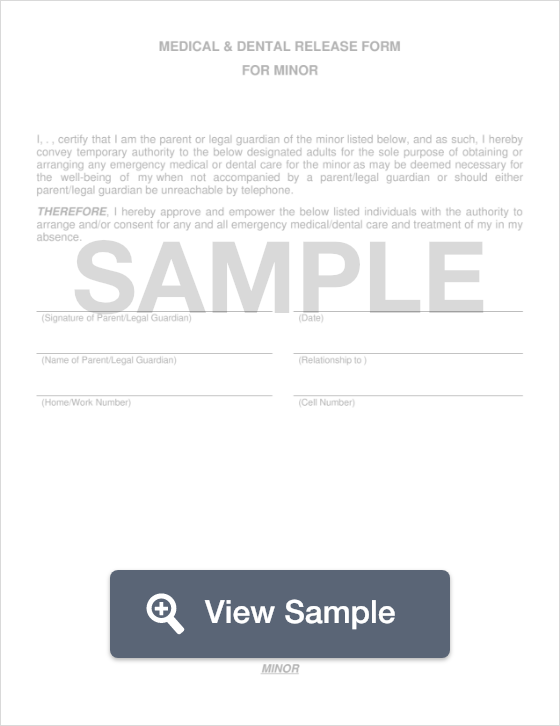 A medical consent form is used to obtain medical consent for certain treatment or medical procedure. 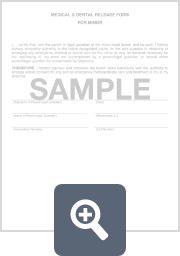 A medical consent form is a common form used in the healthcare industry to obtain medical consent for a certain treatment or medical procedure. It includes information about the patient and provides details about the medical treatment or procedure being performed. Medical consent is typically granted by the patient receiving the treatment, as long as they are of consenting age. For children, consent is generally given by a parent or guardian. For those who cannot speak for themselves, such as someone who is elderly, has a disability, or presents a special need, consent is generally given by a spouse or other family member. A medical consent form is generally complete and consent is officially granted when the person giving consent signs the form. A copy is generally given to both parties. Although specific details vary by state, medical consent means that a physician or other medical care providers must inform a patient of any and all potential benefits, risks, and alternatives involved in a medical procedure. In other words, patients have the right to make an informed decision about their medical care based on all of the available medical information. Informed consent is required whenever a patient requires medical treatment or care that puts them at any risk of injury. Consent is not required for simple diagnostic tests or other procedures where a patient’s participation implies consent. Informed consent recognizes a patient’s right to be informed about a procedure, treatment, surgery, or other medical procedure before deciding whether or not to proceed with the procedure. Informed consent is designed to protect patients, who have the right to refuse any treatment they do not desire. For doctors, as long as a patient is mentally capable of making informed, rational medical decisions regarding their healthcare, medical treatment cannot begin unless informed consent is granted. If the patient is a minor, has a serious mental disability or cannot give consent, the patient’s parent, legal guardian, or court-appointed executor must grant consent. Keep in mind that these medical and informed consents are used interchangeably. Often, medical consent situations are expected, but in other cases, they arise in moments of medical emergency. This guide is designed to provide you with all of the information you need to manage any medical consent scenario, anticipated or unexpected. What function Should a Medical Consent Form Serve? 1.) Summarize the nature and purpose of the procedure. Knee replacement is a surgical procedure to relieve disability or pain and improve/sustain mobility of the knee. It involves partial or total replacement of damaged and/or diseased weight-bearing parts in the knee-joint with plastic and/or metal components. 2.) Provide an overview of risks and alternatives, and state that all risks, as well as any possible alternatives, have been explained to the patient/caregiver. I understand all possible risks of knee surgery which include damages incurred to the leg and surrounding area. I understand all possible risks of invasive procedures include infection, bleeding, paralysis, stroke, permanent injury, and death. Possible alternatives to knee surgery include _________. The purpose and nature of this procedure have been explained to me. I have also been informed of all medically significant risks of the aforementioned procedure. I am aware that no guarantee can be made regarding the outcome of the aforementioned procedure. All reasonable alternative treatments, including consequences and medically significant risks, have also been explained to me. I have also been made aware of the risks and consequences of no treatment. The benefits of knee replacement surgery include _______. One of the risks of knee replacement surgery is _________. This will ensure that the patient/guardian has a complete understanding. 3.) Function as a Waiver. In this last section, the patient/guardian must provide his or her legal consent. The patient's full legal name must be provided, along with the name of the procedure and the full legal name of the physician and healthcare institution. When Do You Need Medical Consent? Informed consent is required whenever a patient requires medical treatment or care that puts them at any risk of injury. Consent is not required for simple diagnostic tests, x-rays or other procedures that are not life-threatening where a patient’s participation implies consent. If a physician determines a patient is experiencing a medical emergency, they can treat the person regardless of medical consent. For example, if a person is unconscious and in danger of death or serious injury, if care is not immediately administered, medical consent is not required. This may include a blood transfusion, surgery, or other life-saving medical treatments. For minors: the requirements for medical consent are even lower. In many cases, a doctor can administer care without consent, even if the patient is not experiencing an emergency. The state can also override parents under the “parens patriae” doctrine, which enables the state to act as a parent and grant consent for medical care. Child Protective Services (CPS) may also be called in to give consent. What is the Process of Informed Consent? The patient is informed about the possible risks and benefits of the treatment. The patient is told about risks and benefits of other options, including no treatment. The patient has a chance to ask the doctor questions. The doctor must answer all questions. The patient has time to discuss the plan with family or advisors (if needed). The patient considers all provided information and makes a decision in their best interest. The patient shares their decision with their doctor. The patient signs a consent form, if necessary. Note: Once you sign a consent form, you have legally agreed to the plan or procedure on the authorization form, unless you revoke the consent before treatment is given. What is child medical consent? In these instances, a medical consent form for a child may simply specify whether or not the adult chaperone is authorized to consent to elective medical procedures. Even in situations where co-parents share legal custody, having a medical release form that has been notarized by a notary public ensures that treatment will not be delayed in the event of a medical emergency. If you are a stepparent, you have no official legal status to authorize medical treatment for your child. In the event of a medical emergency, the child will be treated, but in less serious situations (e.g. a broken arm) they may not be treated until a biological parent can provide consent. To avoid this situation, you can have your partner grant you a power of attorney, or have a form signed by your partner and their ex-partner authorizing you to represent your partner when consenting medical procedures. Elderly patients may present consent issues related to mental competence. In these cases, it is recommended they have a Power of Attorney or other documents that clarify consent authority. Elderly patients should have documents that outline decision making authority for elderly patients readily available to provide to medical professionals. Recurring treatments also commonly present consent issues with elderly patients. When a patient agrees to undergo recurring treatment, the initial informed consent process covers the entire course of medical services provided during treatment. However, patients should know that they can question the treatment process and have the option to decline any individual treatment. Informed consent also covers clinical trials and research. If you participate in either, here’s what you need to know about informed consent. Keep a copy of the consent form or ask for one if you aren't provided one. No informed consent document can require you to waive your legal rights. If you need help understanding a consent form before signing it, make sure you ask for help and take your time. After the back and forth between a patient and their doctor is completed (outlined above), a patient may decline the physician’s recommendation and acknowledge the risks of doing so. This action is called informed refusal. The standard for a physician in a malpractice suit is how other physicians in their specialty would have responded in a similar situation. If other physicians would have acted similarly, then no malpractice exists. If, however, other physicians would have acted differently, malpractice may have occurred. For minors, whether a lawsuit is filed and how malpractice lawsuits are handled depends in part on the child’s response to treatment--i.e. if a minor responds positively to treatment, it is hard to find evidence of malpractice. We hope this guide provides you with important information about the medical consent process and legal standards informing it, as well as your rights as a patient or parent or guardian of a patient. Whether medical situations arise requiring consent are expected or unexpected, we believe this guide provides you with the information you need to navigate the medical consent process in an informed manner that guides you through planning ahead for any unforeseen medical consent emergency. Medical consent is a form that is used by a parent or guardian to give permission to another person or health facility to provide medical treatment for their child or ward. A medical consent form is a necessity if the child is traveling with someone who is not their legal guardian and cannot make medical decisions. A living will is a necessity for every adult. The purpose of a living will is to give you a way to express your wishes for medical care in the event that you are no longer able to voice those wishes on your own. When someone dies, the person who is named as the executor may create an affidavit of death. An affidavit of death is a sworn statement that the person named is deceased. Guardianship is legal protection for a care provider who has responsibility for a child or vulnerable adult.